Singing neighbors, mobile phone talkers, and kids playing outside my door. My front door was in need of some soundproofing, because I live in a HOA, I am not allowed to install a new door. I have been searching the Web for instructions on a DIY soundproof door. The instructions, I have come across are just impractical and ugly. Having not found anything to my liking, I decided to design it myself. While the finished project is not completely soundproof, it has reduced the noise to tolerable level. During this project, I also turned a ordinary door into something that is unique and stylish. In fact if you do not need the soundproofing, you can just go straight to installing the tin on your door. The first step is to purchase some M-D Rolled Packaged Door and Window Weatherstripping and a door sweep or door threshold that seals. 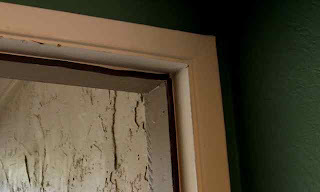 After installation you will want to make sure your door is airtigt. Turn off the lights and have someone stand on the outside and shine a light at all the sealed areas. If you see light on the other side, then your door is not airtight and sound will enter through these spaces. You will also need the following tools and items. MLV / Mass Loaded Vinyl with adhesive backing from Super Soundproofing Co.
Tin Ceiling Tiles from The American Tin Ceiling Co.
wonderful tips, thank you for taking your time to write this up. It has helped reduce the nightly return of my drunken housemates to a bearable 'dull roar'. Now do you have a solution to stop them drunkenly trying to enter my room by mistake... or how to soundproof a single paned glass window for garbage trucks that come by at 4:45am and use the intersection outside my window as a turning circle. In response to the above post. Perhaps you can try draping a a specially made sound-proof doormat over your window to help dull the noise from the trucks as advised for how to sound proof your door from ehow.com. Hang a specially made sound-proof doormat over the existing door. This works best if the door is flat. Depending on the doormat you choose, you can attach it with adhesive or peel-and-stick backing. For your window issue they have double glazed windows that you place behind the existing windows or if you have the room you could get a cheap window at the Home Depot and install behind the existing window. Soundproofing your exterior door is a great idea. The design that you made looks good. Thanks for sharing.